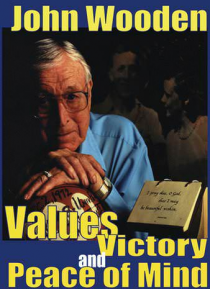 Values, Victory and Peace of Mind presents the greatest coach of the 20th Century Coach John Wooden teaching his powerful values based philosophy of how to achieve competitive greatness in sports, business and life. John Wooden's UCLA basketball dynasty won an incredible ten national championships, seven of them in consecutive years producing perfect season after perfect season. Yet for John Rober… t Wooden winning was never his standard for success. How you win or lose is the ultimate test.